There’s a prophecy that is shared among a great number of distinct cultures all over the world involving the Eagle, representing the masculine, and the Condor, representing the feminine. It’s unclear what the original source of this prophecy is, but it is generally agreed that it goes back many thousands of years. It’s often told by elders and shamans from the native people living in the Americas and Amazon (such as the Incas). 1 Throughout the years there have been some changes to some of the details in the prophecy in some cultures, but the overall theme stayed the same. 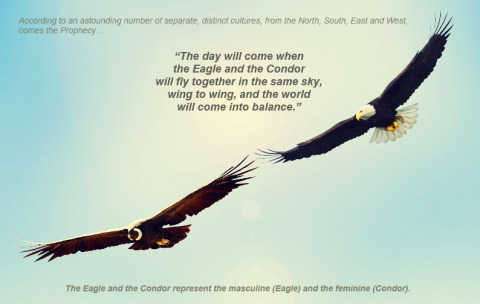 Basically it is said that thousands of years ago, the human race was divided into two groups, a masculine group, represented by the Eagle, and a feminine group represented by the Condor. This division would be the cause of many problems within the human race and around the world. 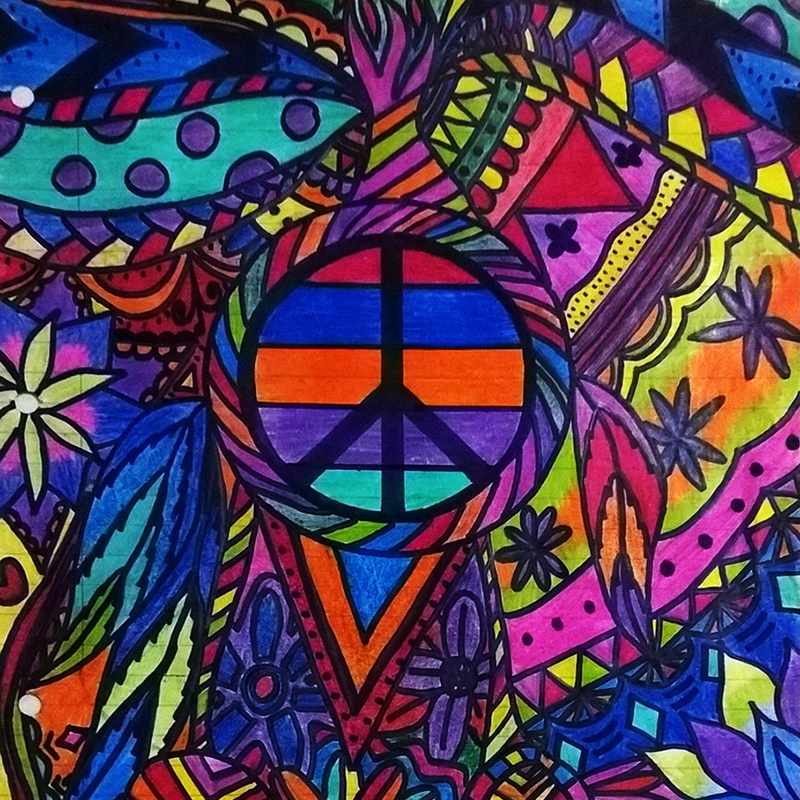 However, it was foretold that a time would come when the Eagle and the Condor would get the opportunity to get back together again and fly together in the sky as equals bringing balance and peace. It would be a time of spiritual reunion, when the sacred masculine and the sacred feminine would be connected again, and the human race would connect back with nature. It’s also amazing that all the different sources of this prophecy point at the time we’re living in right now as being the moment when this reunion will happen. A Twin Flame is a spiritual (esoteric or New Age) concept describing a special soul connection between two souls. The Twin Flames are thought to be a template for an ancient/eternal type of relationship between lovers. The fundamental thought behind this concept is that the dawning new era in human spiritual evolution will be a time when relationships foster enhanced spiritual growth between lovers, whereas in previous times and still early in the 21st century couples stayed together for purposes of physical survival and economical safety more than anything else. According to the mythology of Twin Flames, in the beginning of time we were created from one source, that was split into smaller and smaller units down to two souls (and on rare occasions, halves of one soul) that would journey to Earth to learn an experience duality. They would reincarnate over lifetimes with this longing for each other, often meeting until, they would reunite and then leave this physical plane as one. In his dialogue The Symposium, Plato has Aristophanes present a story about soul mates. Aristophanes states that humans originally had four arms, four legs, and a single head made of two faces. He continues that there were three genders: man, woman and the “Androgynous”. Each with two sets of genitalia with the Androgynous having both male and female genitalia. The men were children of the sun, the women were children of the earth and the Androgynous were children of the moon, which was born of the sun and earth. It is said that humans had great strength at the time and threatened to conquer the gods. The gods were then faced with the prospect of destroying the humans with lightning as they had done with the Titans but then they would lose the tributes given to the gods by humans. Zeus developed a creative solution by splitting humans in half as punishment for humanity’s pride and doubling the number of humans who would give tribute to the gods. These split humans were in utter misery to the point where they would not eat and would perish so Apollo had sewn them up and reconstituted their bodies with the navel being the only remnant harkening back to their original form. It is said that when the two find each other, there is an unspoken understanding of one another, that they feel unified and would lay with each other in unity and would know no greater joy than that. What is clear is that their attack vector included our women and our sexuality, or in other words, the way men and women connect with each other at the highest and most intimate level. You have to understand that when it comes to “divide and conquer” strategies, nothing can divide the human race more than when you do it at the level of the sexes; it divides the human race at the very core of its existence. Whoever did this to us, knew exactly what they were doing. And when I mention that they targeted our sexuality, I don’t just mean the physical part of it, but also the emotional/mental aspect. And both of them are very important. We’re prevented from experiencing love to the fullest, without our minds being contaminated by all the brainwashing. When “civilization” as we know it today was enforced on humankind thousands of years ago by the gods, it was founded upon the basis of sexual repression which had the purpose of dividing the human race at the fundamental level of the sexes, so that they would be easier to control, manipulate and enslave. Like I explained in the third part of my Understanding Women article series, when it comes to divide and conquer strategies, nothing can divide the human race more than when you do it at the level of the sexes; this divides the human race at the very core of its existence. By creating inequality, contradiction, conflict and friction in interactions between men and women — the basic and most important social relationship we can have — this frustrates and weakens the entire race at the most fundamental level. For example, instead of men and women naturally coming together and easily forming healthy (sexual) relationships based on equality, what we have right now is stupid courting and dating games that cause difficulties and waste a lot of our time and energy. We also have marriages where men are encouraged to dominate over women and treat them like their property, while forcing both men and women to sacrifice their individuality, become dependent and live against their true nature. In such an environment — one that is filled with social constructs promoting sexual repression — it becomes difficult for men and women to form stable and robust relationships and to satisfy their sexual desires. Hence they become weaker and can be easily manipulated, especially via their sexuality (I discuss some examples in the second part of my Understanding Women article series). I didn’t know about the Eagle and the Condor prophecy until yesterday, and found out about Plato’s story a few hours ago. An acquaintance had mentioned the Twin Flames concept to me a few months ago, but I didn’t yet have a chance to look into it before. I bet that you can easily see the similarities with those stories and my own theory. So again it appears highly likely that I am on the right track when it comes to my theories on women and our sexuality, and that my articles on the subject probably come much closer than anything else out there to really explaining the prophecy of the Eagle and the Condor, the Twin Flame concept, and even Plato’s story about soul mates. Previously I already had much of my theories and conclusions confirmed by Dr. Wilhelm Reich’s research. Examining the war between Anunnaki brothers Enki and Enlil, Christine Hardy reveals how the concepts of sin and the inferiority of women were born out of Enlil’s attempts to enslave and then wipe out humanity, repeatedly thwarted by Enki and Ninmah. The author further explains how the sacred sexuality taught to humans–still seen in Tantric practice–became suppressed millennia later by the patriarchal concept of original sin and how innocent Eve took the blame for the expulsion from Eden and fall from Grace. Showing that the god who created us was not the same god who expelled us from Eden, Hardy explains that there will be no apocalypse because the Good/Evil duality has never truly existed–it has been only enemy gods fighting and implicating humanity in the wake of their own competition for power. In the video below you can hear Zulu sanusi Credo Mutwa talk about ancient African stories that mention how thousands of years ago beings came from the sky in giant orbs, and divided men and women in order to enslave them. Compare Credo’s story with the Sumerian/Akkadian stories of the Annunaki (see Zecharia Sitchin’s books for this), Plato’s story about soul mates, the twin flames concept and the prophecy of the eagle and the condor. The Jesuits and French explorers told stories of Native American men who had “Given to sin” and “Hunting Women” with wives and later, the British returned to England with similar accounts. George Catlin said that the Two Spirit tradition among Native Americans “Must be extinguished before it can be more fully recorded.” In keeping with European prejudices held against Natives, the Spanish Catholic monks destroyed most of the Aztec codices to eradicate traditional Native beliefs and history, including those that told of the Two Spirit tradition. In 1530, the Spanish explorer Cabeza de Vaca wrote in his diary of seeing “soft” Native Indian males in Florida tribes dressing and working as women. Just as with all other aspects of the European regard for Indians, gender variance was not tolerated. Europeans and eventually Euro-Americans demanded all people conform to their prescribed two gender roles. The Native American belief is that some people are born with the spirits of both genders and express them so perfectly. It is if they have two spirits in one body. Some Siouan tribes believed that before a child is born its soul stands before The Creator, to either reach for the bow and arrows that would indicate the role of a man or the basket that would determine the role of a female. When the child would reach for the gender-corresponding hand, sometimes The Creator would switch hands and the child would have chosen the opposite gender’s role and therefore casting its lot in life. Native Americans traditionally assign no moral gradient to love or sexuality; a person was judged for their contributions to their tribe and for their character. It was also a custom for parents to not interfere with nature and so among some tribes, children wore gender-neutral clothes until they reached an age where they decided for themselves which path they would walk and the appropriate ceremonies followed. The Two Spirit people in pre-contact Native America were highly revered and families that included them were considered lucky. Indians believed that a person who was able to see the world through the eyes of both genders at the same time was a gift from The Creator. Traditionally, Two Spirit people held positions within their tribes that earned them great respect, such as Medicine Men/Women/shamans/visionaries/mystics/conjurers, keepers of the tribe’s oral traditions, conferrers of lucky names for children and adults (it has been said that Crazy Horse received his name from a Winkte), nurses during war expeditions, cooks, matchmakers and marriage counselors, jewelry/feather regalia makers, potters, weavers, singers/artists in addition to adopting orphaned children and tending to the elderly. This entry was published on Sunday, September 21st, 2014 at 6:34 pm by Karel Donk and is filed under Personal Religion Science Takes on Life love relationships sexual repression sexual suppression sexuality true love. You can use the permanent link to bookmark and/or share it.